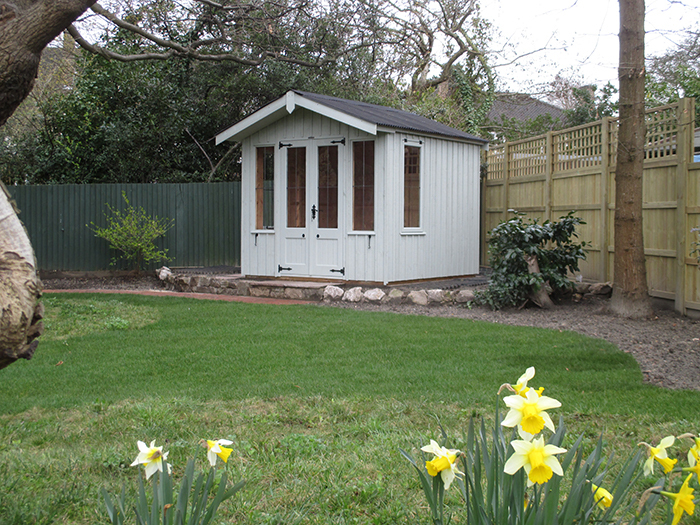 Named after an idyllic National Trust area located in the serene Constable Country, Dedham Vale, our Flatford Summerhouses are the ideal timeless addition to any garden. Perfect for those seeking something more traditional, our entire National Trust collection features rustic-cut, vertically-sawn cladding in the Disraeli Green shade and unique cast-iron door furniture with Fleur-de-Lys details. 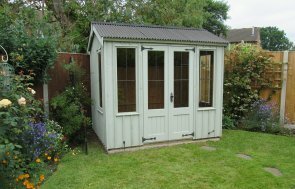 This 2.4 x 2.4m Summerhouse also enjoys a pent roof covered in traditional corrugated material, and a small overhang providing both shelter and shade. The windows in the summerhouse are leaded in style and 2 of them open to let a breeze pass through on balmy summer days. We are an FSC certified company partnered with a timber mill in North Sweden. This ensures we always have a supply of the highest quality timber that's managed in a sustainable way.This means that your garden building is of the best standard which is built to last. We know that there's a garden building to suit everyone. Come and visit us at one of our eight show sites across the UK to see more than 25 garden buildings on display for you to explore. If you would like to browse our entire National Trust collection, which also features traditional garden sheds, you can take a look online. Have you been inspired by this superior garden shed? If so, and you'd like to continue browsing online, click the link below.